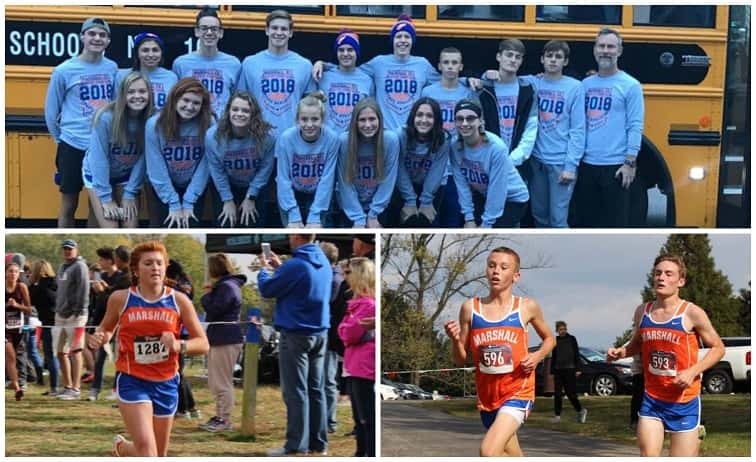 Marshall County’s cross country teams were among the 586 runners who competed in Saturday’s Class 3A KHSAA State Cross Country Meet at Lexington’s Kentucky Horse Park. Madisonville-North Hopkin’s senior Christian Parker took the Class 3A state title finishing in 15:48.22 leading the Maroons to the best finish of any Region I team, coming in eighth. Trinity took the state title followed by St. Xavier in second and the Marshals placed 20th. Samuel Lanham had the top finish for the Marshall County boy’s team, placing 74th in 17:35.49 followed by Ethan McCarty in 98th in 17:49.75. Rounding out the team results, Knox Sandlin finished 108th (17:54.15), Christian Cosner 131st (18:08.17), Jackson Miller 152nd (18:18.70), Ethan Dowell 157th (18:21.41) and Mason Cosner 295th (20:46.56). Madison Central’s Ciara O’Shea took the girl’s Class 3A state title finishing in 18:41.90 while McCracken County’s Maggie Aydt finished third in 19:17.75. Oldham County won the team title, Daviess County took second and the Marshall County girls placed 34th. Gabbi Lovett finished 108th in 21:56.71 for the best finish for the Lady Marshals. Following Lovett was Alexia Minter in 152nd (22:37.24), Tarryn Story 171st (22:57.60), Zoie Swoope 208th (23:30.95), Leah Vincek 224th (23:45.53), Hannah Perry 242nd (24:13.24) and Chloe Newton 272nd (25:44.77). In Class 1A competition, Christian Fellowship’s Andrew Allen finished 151st (19:59.70), Mikey Bivin 154th (20:04.38) and Boaz Burnett 190th (20:49.30).